The Green Economy, in the context of sustainable development and poverty reduction, is currently the most important item on the international environmental policy agenda. While conferences proceed and countries prepare for a transition to the Green Economy as advised by UNEP, the definition of the concept remains contested, yet still demanded. In parallel, countries have requested, and agreed on principle that they be given relative flexibility to dictate the implementation of their transitions. The result, like sustainable development before it is a multiple meanings which may position the Green Economy concept for failure in the long term as these meanings erode its practical relevance across contexts. 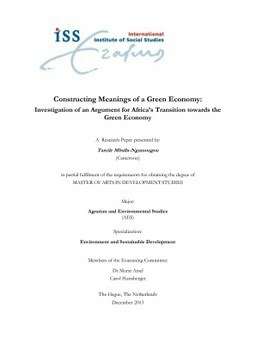 By means of argumentation analysis supported by framing theory, this study argues that the fulfillment of both requests is not necessarily compatible as countries define and redefine the concept of the Green Economy within different contexts. It also argues that ultimately Green Economy does indeed share weaknesses similar to those observed in sustainable development literature which may lead to its long term irrelevance and dim the likelihood of achieving its purpose. The object of analysis is a speech given at an African Economic Conference that is analysed to illustrate the already existing divergence of definitions and expose these weaknesses.